Oct 09, 2017: brewing methods? Oct 19, 2017: Where are those Starbucks Iced Coffees? 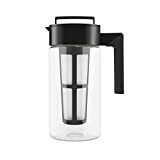 Jan 06, 2018: Should I buy an iced coffee maker, or is there a way to make it without buying some gadget? Mar 01, 2018: Cold brew advice for a novice? Mar 13, 2018: How can I perfect Peet's Cold Brew at home? Feb 07, 2019: I am the only exMo in a house of TBMs; what are some ideas/perfect products for making coffee for just one person, both regular and decaf? Took a shopping trip and was just overwhelmed by all the products/choices and left empty-handed and clueless! Feb 14, 2019: Easier ways to make kefir? Feb 25, 2019: Filtering cold brew grounds through paper filter overnight? Apr 20, 2019: Cold Brew...How do YOU do it?? ?